Aelfre (as Aelfre) had his last Listener back in 1994, but (as someone else) appeared in November last year with a TS Eliot theme. This week, we had a gramophone record to complete… how quaint. Only twenty radials, and of the variety where no entry shared letters with a neighbour. My initial reaction was “Not another LP that will trip me up… like my woeful Yellow Submarine entry”! In a way, I hoped that the title would lead us to a piece of true classical music although the requirement for a BAND in the centre made that unlikely. 9rad MALONE Cheers boss, Sam Beckett’s moribund character? Aelfre seemed to like definition + double wordplay. When I saw what looked like FIGARO in arc 3, I wondered if my suspicion about the theme being a true classical piece looked plausible. 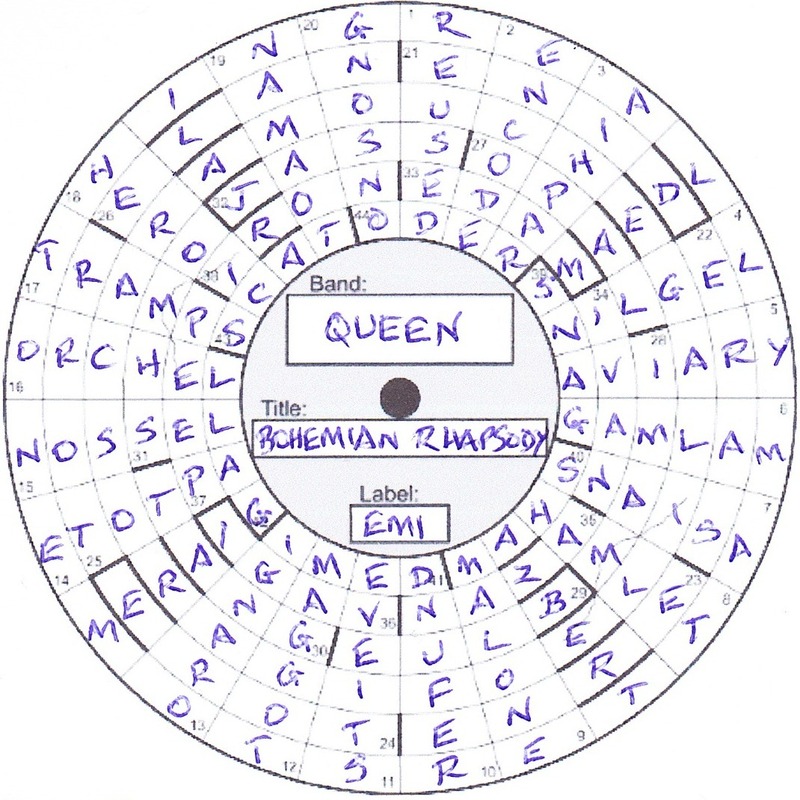 However, working back in that arc revealed GALILEO trying to make himself known (as well as SCARAMOUCHE), and we had Bohemian Rhapsody by Queen as our classic Freddie Mercury track. The penultimate line of the song in ring 1 reads NOTHING REALLY MATTERS TO ME. This is, in my view, one of the greatest songs and, over forty years after its release, still gets significant air time. Thanks for a gentle puzzle Aelfre and an excellent theme, commemorating the 25th anniversary of FM’s death at the age of 45. This entry was posted on 30 December 2016 at 4:00 pm	and is filed under Solving Blogs. Tagged: Aelfre, Bohemian Rhapsody, Classic FM Track, Freddie Mercury, Queen. You can follow any responses to this entry through the RSS 2.0 feed. You can leave a response, or trackback from your own site.